I don’t think I have shared my non-secret with you… I LOVE puppets! Maybe it’s because I grew up in the golden age of puppetry with Fraggle Rock, Muppets, Mr Dressup, Mrs Rogers Neighbourhood, Sesame Street, and local favourite Today’s Special and Romper Room. Over the years I have created with puppets as a way to get around production hurdles, mainly no one at my museums wanted to be on camera – yet I was tasked in creating content. Video has been the king of content for a while now, so I always tried to think outside the box when trying to make something on a shoestring budget of a few hours, an iphone, and a museum at my disposal. And so Harry the Haggis episodes were born to explore the tradition of Hogmanay at Gibson House! Soon my museum workers were seeing the fun of content creation and I expanded my cast from fuzzy creatures and finger puppets. 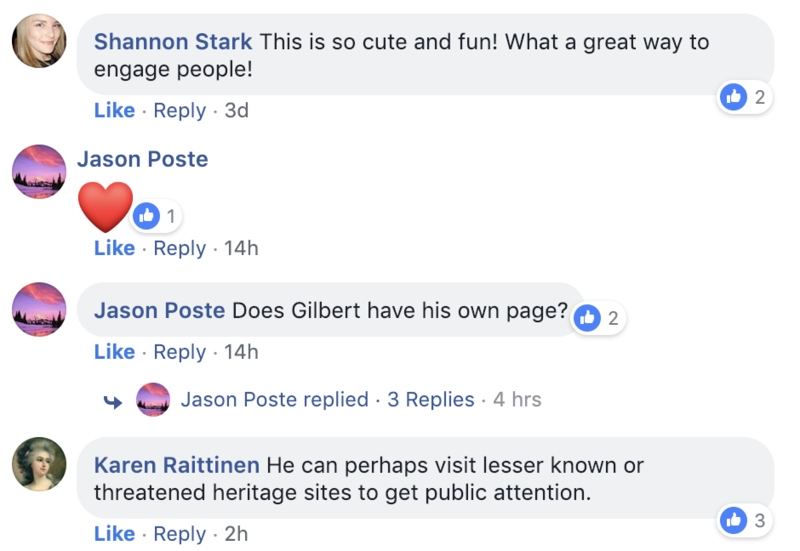 It sounds like Philbert Gilbert Dilbert needs to go on a museum adventure around our city! I’m currently researching what grants if any would support a web-series about a puppet interning at museums in the name of supernatural and history. Got any leads? I’m happy to hear them!